What is Moishe Mana’s plan for the downtown Miami and Wynwood properties that he has been accumulating for years? “Now it’s a waiting game of who will make the next move. There will be no more flipping downtown,” broker Mika Mattingly told the SFBJ yesterday. Mattingly represented Mana in most of the downtown purchases. Mana’s Wynwood and downtown properties were both submitted to the Beacon Council, who then forwarded them to Amazon in the Miami bid package, Mana representatives confirmed. Most of Mana’s downtown properties are vacant, Mattingly added. She added that Mana’s downtown development rights there could be over 8 million square feet. In Wynwood, where Mana has over 10 million square feet in development rights, Amazon would be limited by a lack of transportation and housing supply. Update: Mana has rights to develop over 8 million square feet in downtown, according to Mattingly. Bet you Amazon would finally decide, complete the HQ2 build, and Mana will still play the waiting game. For the person that said he was greedy. I don’t think its a greed thing as much. I just think he likes the attention. That’s all. I once said he was the kim kardashian of Miami. Anything to grab the media’s attention and now he has attached himself to the Amazon news, because it’s big news in Miami. Yup, he likes to entertain. More socialite than developer. Hehe…all developers in Mia are socialites and attention whores…only in this city they get 3 pages stories in every magazine decoted to their success, personal life, etc…media adores them and have had them in a pedestal for way too long. A new excuse to not develop. Sort of funny. Can’t wait to see whats (not) next from him! Glad Mana representatives confirmed they were sent to Amazon, but since the application was confidential, they have no clue if they were or were not infact included. More smoke and mirrors. If Amazon comes to Miami, zero chance the go to Mana. 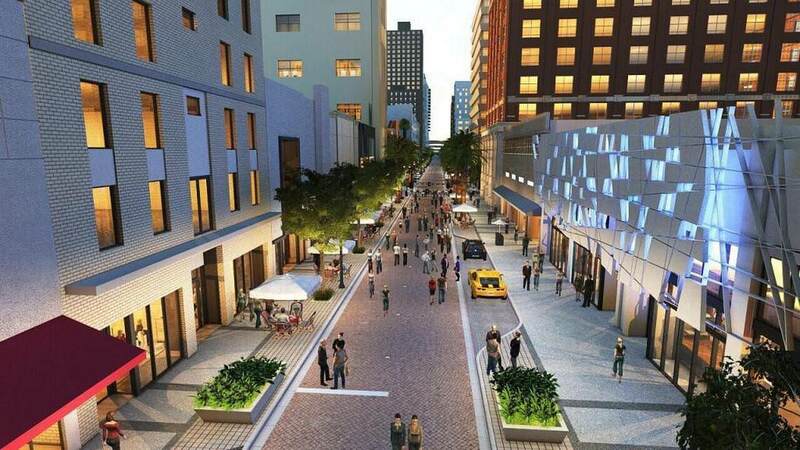 So, he’s allowed to hold vacant (and in a sense hostage) most of the prime street level space in downtown Miami. Pretty lousy situation for residents and existing retail owners. If I were Mika i’d be saying all this without remorse too. She’s made enough money with Moishe to last a lifetime. Guy’s a fraud though, get him outta town. A TOTAL WASTE OF SPACE. His whole organization is an echo chamber for his nonsense. Also, don’t think Bezos can make a deal with somebody who overvalues their property by a 2x factor. You just became mayor. Relax. Lol. Concentrate on the SMART plan. Peppering a legitimate argument with hate delegitimizes it — doesn’t really help you get your point across. The Wynwood site is an interesting thought. It wouldn’t be that much worse than the Innovation site *IF* we ever start constructing the Wynwood/Edgewater/Midtown/Design District metrorail circlator *AND* put a Tri-Rail (or the possible BrightLine version of TriRail) station somewhere between 24th and 20th Streets. That’s a lot to ask from this city/county/state/federal government, though. Which means it’s obviously not going to happen for 20 more years, if ever. Which means Wynwood is a clear 2nd option to the Innovation parcel, if Miami is even chosen. But the housing situation for the Wynwood site is essentially the same as it is for the Innovation site (and even the Flagler site). It’s absurd to say otherwise. They’re a mile apart. That’s an inconsequential distance to most people. The majority of Amazon’s workers are most likely to commute to work anyways. They’ll want yards, cheaper prices, more square footage, waterfront/beachfront property, etc that most greater downtown sites can’t offer. They come in front, back and side varieties. They offer recreational, entertainment and landscaping opportunities. Innovation is FAR superior than Wynwood. 1. There are thousands (literally thousands) of new high-rise rental apartments between the Melo towers, Zom tower, MiamiCentral apt tower, and existing within 4 blocks. What’s the tallest building in Wynwood? How many units? 2. The Marriott convention hotel (1,100+ rooms and convention/meeting space) is 2 blocks from Innovation. How many hotel rooms in ALL of Wynwood? 3. The Network Access Point is a couple blocks away. 4. Miami Dade College, Viacom Studios, Herzog deMureon Art Museum, Grimshaw Science Museum, Cesar Pelli Performing Arts Center, AAArena, a Bay walk, all within a few blocks of the Innovation district. The comparision is not even close. Mana is always waiting. When will he start renovating? And enough of the LED billboard towers. Put a fork in that scam. Ok, so this Comment has nothing to do with this particular story, but I’m going to post this opinion wherever I can. So this means you’re going to see this quite often. Please forgive. And if you feel the same please pass it on till we see some results. Miami, world-class city/Third World Rd. Taking the construction out of the equation, I 95, in Miami -Dade looks like a dump. The landscaping is a disaster, the amount of garbage, debris, car parts, layer upon layer of absolute garbage piled onto the side of the road and off – ramps is absolutely unacceptable for a city that defines itself as a world-class. I Have complained to the mayor of the county, the Mayor of Miami, and the administrators of the southern region of I 95 but To no avail. So now I’m going to start posting this everywhere I can. There’s no excuse for this mess when the roads maintained by the county and the Turnpike authorities are spotlessl. When you take into consideration the millions of people that drive up and down I-95 you start to wonder what they’re all Thinking of Miami’s curb appeal. That may be a user issue, not an operator issue. Tollways weed out bad actors and since people are paying a fee, ironically they may be more probable to care than act entitled. Tollways also collect your license plate so some may remind themselves of the big brother element.